This celebrates the fourth birthday of a little boy who was the first baby born at Saltwater in New South Wales in over a century. The beachside area is the traditional place of the Worimi-Biripi people, and is now in a national park. Dawn Morcombe gained special permission to give birth at this spiritually significant location, and she named her son Yarramundi John Michael Hollis. Yarramundi was a famous Indigenous leader of the colonial era; his son was Colebee, who was featured on the blog last year. His name is said to mean “deep water”. Fantastic story, namesake, and meaning, especially for a baby born at Saltwater! Debbie Bell from South Australia has had a rough life and been through more than her fair share of heartache. However, after a great deal of physical and emotional suffering, she and her husband Ian were at last able to have a baby through a donated embryo, and named their son Derlerean. I think Debbie and Ian may have created this name themselves. It reminds me of the car, the Delorean. 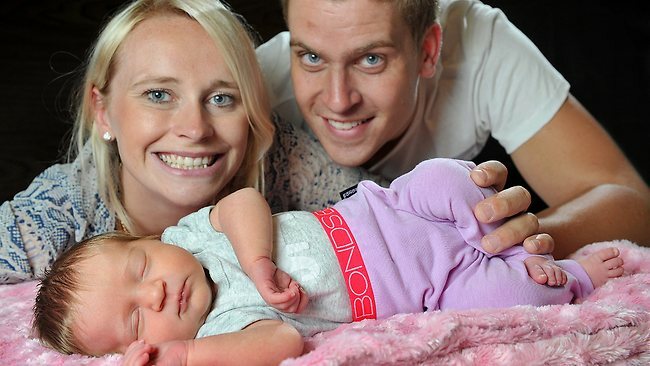 Victorian couple Charlotte Gernandt and Dale Hynes called their first baby Tinkabell Darling [pictured]. Now this sounds like a name straight out of Peter Pan, but Charlotte and Dale say she is not named after the fairy. Um, okay … must be inspired by some other Tinkerbell … She’s called Tinka for short. Emma Preston was so crippled by endometriosis that she was confined to a wheelchair, and had little hope of ever having a baby. But then Sydney fertility specialist Dr Geoff Reid not only got her out of her wheelchair, he helped her to conceive through embryo transfer. Emma was so grateful, she named her baby after him. No, the baby’s not called Geoff; her name is Reid Louise. Nice gesture and name story. It’s not often a baby ends up in the paper just because of his name, but this one is quite striking. Kate Anderson and Lance Walshe, from the Yarra Ranges just outside Melbourne, named their son Viper. His name was inspired by Lance’s love of snakes, and the couple wanted an original name that nobody else had. They considered Wolfgang, but rejected it because they thought it might lead to teasing. Viper Walshe doesn’t have a middle name, and if he’d been a girl, his name would have been Ruby Joanne. Kate says his name has met with mixed reactions. A story from Port Macquarie on the ever-rising prices on electricity bills featured a struggling single mum named Bek Latimore. Bek’s baby girl is named Arizona; although I generally don’t go for American-states-as-names, this one always puts a smile on my face. I’m not sure I can ever imagine using it myself though. Arizona’s older brother is named Nick, which made me think – could Nick be short for Phoenix? Hmm? This story about a midwifery programme at Canterbury Hospital in Sydney showed a mother with an elegant name: Eglantine Jalicot. Eglantine’s son has an equally stylish name – Lysander. His ancient Greek name means “release of a man”, and belonged to a famous military general of ancient Sparta. Eglantine is another name for the sweetbriar, and is first found as a personal name in Chaucer’s Canterbury Tales. Two interesting and pretty girls’ names from a story on sleep and babies: Luna and Reya. Luna is of course Latin for “the moon”, and Reya is an Indian name which means (I think) “wealth”. A story on a new breech birth clinic at Westmead Hospital in Sydney showed mum Mallissa Tulfua with her son Tevita. His name is the Fijian form of David. A Brisbane columnist covers a naming dilemma from real life when two of her friends cannot agree what to name their baby. Readers are invited to help name their sprog, but as we’re not told what names they’ve come up with already, it seemed a rather futile exercise (although apparently the mother had rejected Luke as “not masculine”, which seemed odd). The columnist notes some of the baby names from her own extended family are Echo, Theo, Roarke, Ziad, Ingrid and Rudi. Alana Mahadik had a very difficult childbirth with her first son, Avighna. With her second, she opted for hypnobirthing at Caboolture Hospital in Queensland on Anzac Day, and found the whole experience very quick and stress-free. Her new baby son’s name is Rudra, which is an Indian name meaning, aptly enough, “remover of pain”. Avighna’s name means “remover of obstacles”. A rather adorable little baby girl was sadly abandoned at Canterbury Hospital early this year. The baby has been named Li-Ye, which means “beautiful child” in Chinese. Only a few babies have been abandoned this way in New South Wales in recent years: two others were named Adam and Sunday April. All of these babies were eventually adopted after their birth mothers failed to come forward. An ABC radio podcast on parenting featured a Melbourne child psychologist named Angharad Candlin. This Welsh name meaning “greatly loved” is one I have admired since childhood, yet never before seen on a real person (although I didn’t actually see her, as it was radio). This travel writer, enjoying the Sicilian sun, has the name Dugald Jellie. There’s quite a few Australians with this Scottish form of Douglas as their name, but Dugald Jellie seemed just a bit more interesting and storybook-character somehow. The junk mail of one April morning produced a community newsletter about a new medical centre opening in the area. One of the doctors was named Demelza – a Cornish place name from the Poldark books and TV series. I briefly thought about changing doctors just to have a GP named Demelza, but couldn’t face all the paperwork. I read One Way or Another: The Story of a Girl Who Loved Rock Gods, the memoirs of Gold Coast rock star groupie Nikki McWatters. Eventually she sees the error of her ways, and settles down by sensibly marrying a schoolteacher. Her husband’s name? The very rockstar-sounding Zeus. As well as teaching school, Zeus is a trained opera singer, so she obviously never lost her thing for male vocalists. Channel 7 have resurrected The Price is Right, which I find keeps the troops quietly occupied while I make dinner. As I stir and chop, I keep an ear out for names: so far I have seen a pair of sisters named Jalila and Janita (late teens to early twenties), a woman named Feda, pronounced like “feeder” (twenties), and a grandmother named Dixie (around sixtyish). UPDATE: The mother of abandoned baby Li-Ye has been found; she was an overseas student whose visa had ran out, hence her panic. Tinka, I like, but I’m not sure I feel the same for Tinkabell. I too found Tinkabell and Viper slightly bemusing.